Your Wine Trail Passport is included on the backside of our brochure. Pick up a passport each member of your group at the first winery you visit. Have the winery stamp their logo on the passport. 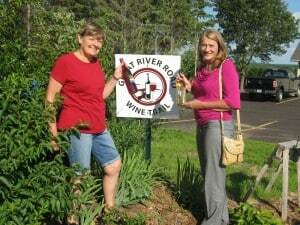 The Great River Road Wine Trail offers a passport program that allows guests to earn a wine glass once they have visited and received stamps from each of the member wineries. No purchase is necessary (but are greatly appreciated), and completed passports may be turned in at any time. At the right is the 2014 GRRWT Case of Wine winner from Eyota, MN. Below is the 2015 winner is from Mason City, IA. 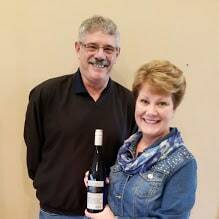 She picked up her case of wine on July 22, 2016 from Linda at Garvin Heights Vineyards. In January 2019 a drawing of all completed passports will be made with the winner receiving a gift certificate for wines from the Great River Road Wine Trail members. Please drink responsibly. Always have a designated driver. The Great River Road follows the Mississippi River from Minnesota to the Gulf of Mexico. We find the bluffs surrounding the river a great place to grow grapes. Copyright © 2019 Great River Road Wine Trail Website + Hosting By Vision Design Group, Inc.